As Ben Bernanke prepares to step down as chairman of the Federal Reserve in January, the public views him somewhat more favorably (38%) than unfavorably (31%), with 32% unable to offer a rating. Bernanke is better known now than he was in March 2008, when 55% could not rate him; at that time, 24% viewed him favorably and 21% held an unfavorable view. The national survey by the Pew Research Center, conducted Sept. 4-8 among 1,506 adults, finds that Republicans view Bernanke less favorably than they did five years ago. 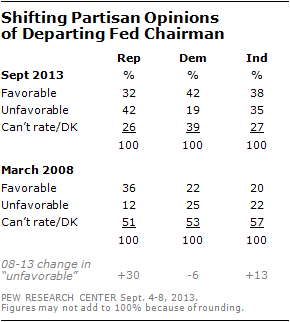 Currently, more Republicans have an unfavorable (42%) than favorable (32%) view of Bernanke. In March 2008, three years after George W. Bush nominated him as Fed chair, Republicans viewed Bernanke favorably by three-to-one (36%-12%). Tea Party Republicans, in particular, have a highly negative view of the outgoing Fed chair. 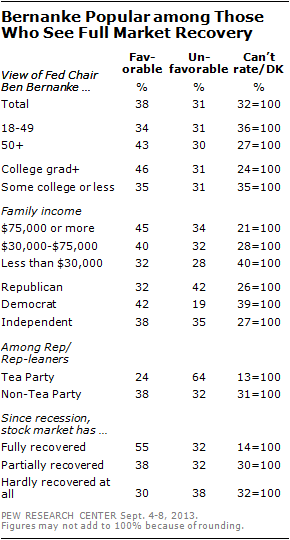 Fully 64% of Republicans and Republican leaners who agree with the Tea Party have an unfavorable impression of Bernanke. That compares with just 32% of non-Tea Party Republicans. By contrast, Bernanke’s image among Democrats is more positive than it was in 2008. In the current survey, Democrats view Bernanke favorably by a 42%-19% margin. 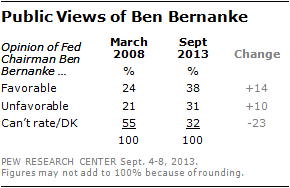 Democrats had mixed views of Bernanke in 2008 (22% favorable, 25% unfavorable). Independents continue to express mixed views of the Fed chair. Bernanke is better known – and better liked – among college graduates than those with less education. About three-quarters of college graduates (76%) are able to offer a rating of Bernanke and they view him more favorably than unfavorably by a 46%-31% margin. Among those who have not completed college, fewer have an impression of Bernanke (65%) and opinions are more mixed (35% favorable vs. 31% unfavorable).